Around 4.6 billion years ago, the universe was a chaos of collapsing gas and spinning debris. Small particles of gas and dust clumped together into larger and more massive meteoroids that in turn smashed together to form planets. Scientists believe that shortly after their formation, these planets -- and particularly Mercury -- were fiery spheres of molten material, which cooled over millions of years. Now, geologists at MIT have traced part of Mercury's cooling history and found that between 4.2 and 3.7 billion years ago, soon after the planet formed, its interior temperatures plummeted by 240 degrees Celsius, or 464 degrees Fahrenheit. They also determined, based on this rapid cooling rate and the composition of lava deposits on Mercury's surface, that the planet likely has the composition of an enstatite chondrite -- a type of meteorite that is extremely rare here on Earth. Timothy Grove, the Cecil and Ida Green Professor of Geology in MIT's Department of Earth, Atmospheric, and Planetary Sciences, says new information on Mercury's past is of interest for tracing Earth's early formation. "Here we are today, with 4.5 billion years of planetary evolution, and because the Earth has such a dynamic interior, because of the water we've preserved on the planet, [volcanism] just wipes out its past," Grove says. "On planets like Mercury, early volcanism is much more dramatic, and [once] they cooled down there were no later volcanic processes to wipe out the early history. This is the first place where we actually have an estimate of how fast the interior cooled during an early part of a planet's history." For their analysis, the team utilized data collected by NASA's MESSENGER spacecraft. The MErcury Surface, Space ENvironment, GEochemistry, and Ranging (MESSENGER) probe orbited Mercury between 2011 and 2015, collecting measurements of the planet's chemical composition with each flyby. During its mission, MESSENGER produced images that revealed kilometer-thick lava deposits covering the entire planet's surface. An X-ray spectrometer onboard the spacecraft measured the X-ray radiation from the planet's surface, produced by solar flares on the sun, to determine the chemical composition of more than 5,800 lava deposits on Mercury's surface. Grove's co-author, Olivier Namur of the University of Hanover, recalculated the surface compositions of all 5,800 locations, and correlated each composition with the type of terrain in which it was found, from heavily cratered regions to those that were less impacted. The density of a region's craters can tell something about that region's age: The more craters there are, the older the surface is, and vice versa. The researchers were able to correlate Mercury's lava composition with age and found that older deposits, around 4.2 billion years old, contained elements that were very different from younger deposits that were estimated to be 3.7 billion years old. "It's true of all planets that different age terrains have different chemical compositions because things are changing inside the planet," Grove says. "Why are they so different? That's what we're trying to figure out." To answer that question, Grove attempted to retrace a lava deposit's path, from the time it melted inside the planet to the time it ultimately erupted onto Mercury's surface. To do this, he started by recreating Mercury's lava deposits in the lab. From MESSENGER's 5,800 compositional data points, Grove selected two extremes: one representing the older lava deposits and one from the younger deposits. He and his team converted the lava deposits' element ratios into the chemical building blocks that make up rock, then followed this recipe to create synthetic rocks representing each lava deposit. The team melted the synthetic rocks in a furnace to simulate the point in time when the deposits were lava, and not yet solidified as rock. Then, the researchers dialed the temperature and pressure of the furnace up and down to effectively turn back the clock, simulating the lava's eruption from deep within the planet to the surface, in reverse. Throughout these experiments, the team looked for tiny crystals forming in each molten sample, representing the point at which the sample turns from lava to rock. This represents the stage at which the planet's solid rocky core begins to melt, creating a molten material that sloshes around in Mercury's mantle before erupting onto the surface. The team found a surprising disparity in the two samples: The older rock melted deeper in the planet, at 360 kilometers, and at higher temperatures of 1,650 C, while the younger rock melted at shallower depths, at 160 kilometers, and 1,410 C. The experiments indicate that the planet's interior cooled dramatically, over 240 degrees Celsius between 4.2 and 3.7 billion years ago -- a geologically short span of 500 million years. "Mercury has had a huge variation in temperature over a fairly short period of time, that records a really amazing melting process," Grove says. 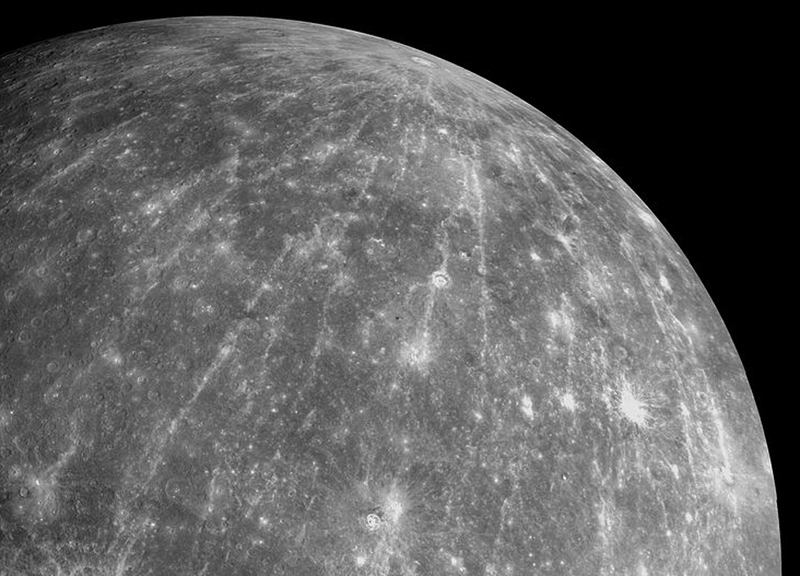 The researchers determined the chemical compositions of the tiny crystals that formed in each sample, in order to identify the original material that may have made up Mercury's interior before it melted and erupted onto the surface. They found the closest match to be an enstatite chondrite, an extremely rare form of meteorite that is thought to make up only about 2 percent of the meteorites that fall to Earth. "We now know something like an enstatite chondrite was the starting material for Mercury, which is surprising, because they are about 10 standard deviations away from all other chondrites," Grove says. Grove cautions that the group's results are not set in stone and that Mercury may have been an accumulation of other types of starting materials. To know this would require an actual sample from the planet's surface. "The next thing that would really help us move our understanding of Mercury way forward is to actually have a meteorite from Mercury that we could study," Grove says. "That would be lovely."